As I had my morning coffee this Christmas Eve, I was reading through some news sites and blogs and was amazed at what I saw, news about retailers sales figures this Christmas, the latest news about the A&E and Duck Dynasty controversy, Planned Parenthood releases a 12 days of contraception video (really???!). I saw blog posts on why we should be buying this or that technology this Christmas, I saw videos that play at the heartstrings (Apple I’m calling you out here with your Misunderstood commercial) but still miss the point of this time of year. Now don’t get me wrong, I’m not a scrooge, I love this time of year — the gifts, the lights, the songs, the TV specials. I love Santa Clause and all the goodness he represents. I love all the fun and excitement the children have on Christmas morning. But do we still remember why this exists? I think it’s all about the blessings. The blessings that we are to others when we give them a gift or simply our time. The gift that God gave us in his Son, the greatest gift of all. It’s about the blessings, not receiving, but giving. As I said, I love the idea of Santa Clause. Looking back at the origins of Santa, we go back to St. Nicholas, a fourth century bishop famous for giving gifts to the poor. In one legend, he gave bags of gold, in secret so as not to embarrass the recipients publicly for accepting charity, to three daughters who could not afford their dowry and would most likely become prostitutes. St. Nicolas was a blessing to those he helped. 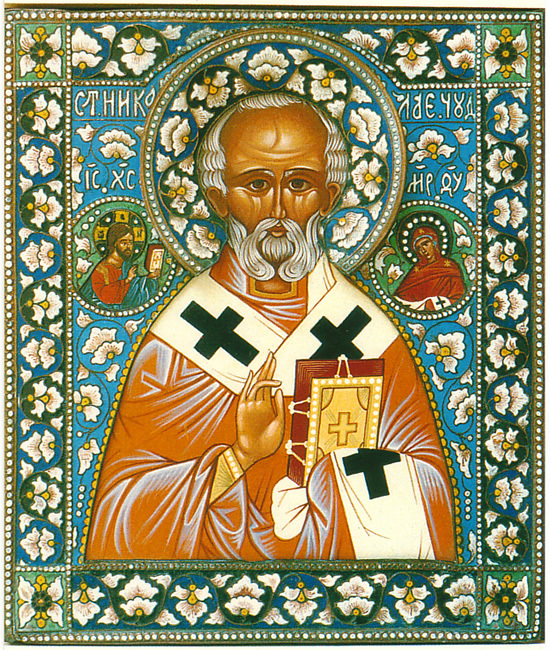 St. Nicolas devoted his live to Christ, he could help himself but to be a blessing to others. I don’t like the term “War on Christmas”. I don’t think it’s accurate. I think what we have is a situation where we as Christians are neglecting the true meaning of Christmas. We are falling into a trap where we are keeping the blessings to ourselves, being recipients of blessings, but not being a blessing to the world. So what can we do today, in this age of commercialism and selfishness? Wake up each morning and ask yourself….Who Can I Bless Today? God will show you. Be forgiving. Not just on Christmas or Thanksgiving, but year round. Be difficult to offend. Be quick to forgive those in your family and circles of influence. Be giving and forgiving to those on the margins of society. Change lives one day at a time. Even a small contribution can add to a great difference in those that receive. Reflect back on your life and count your blessings. Be thankful for all that God has given us. What if God only gave us what we thanked him for? Small steps, but each reflect a blessing that you can be to others. Who cares what the media says, what political correctness deems we can or can’t say or think, what those non-believers and cynics say we “must” believe…..if we take small steps, despite their efforts to squash the meaning of Christmas, we can be a Christmas blessing all year round. God Bless all of you and Merry Christmas!